On January 29th, Bulpros was awarded the Prize of the German Economy in the large enterprise category by the German-Bulgarian Chamber of Commerce. The official ceremony was held in Sofia Opera and Ballet. 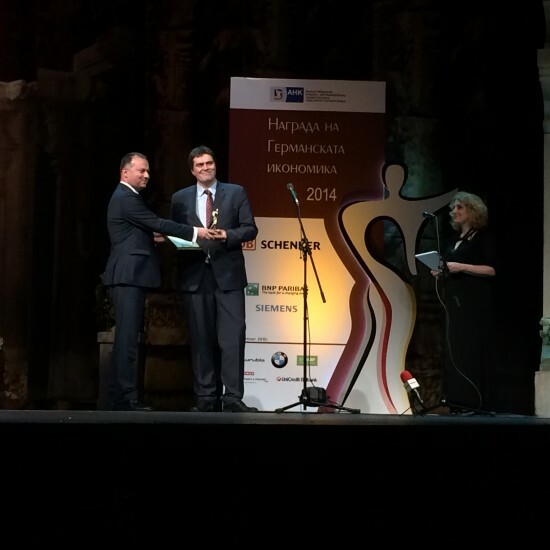 The German-Bulgarian Industrial Chamber of Commerce (GBCIC) presented its annual awards for 11th time. The biggest award in the category “Large enterprise” was given to the fastest growing IT company in Bulgaria – Bulpros Consulting. Mr. Lyuben Petrov, Deputy Economy Minister, handed the statuette “Glory”, made by the sculptor Alexander Proinov, to Ivaylo Slavov, Bulpros’ CEO. This is the first year Bulpros is competing in the large enterprise category and was selected first among the 8 nominees in this category. About 70% of the revenue of Bulpros Consulting for 2014 was generated from its business relations with more than 30 German companies. During the last 4 years the company is on a clear profitable growth path with 95 percent growth in revenue year-over-year in 2014.
says Ivaylo Slavov, Bulpros CEO. The awards traditionally distinguish the best small and large companies in the country, which have developed successful business relations with Germany throughout the past year. With this award, Bulpros has been recognized as the largest company in Bulgaria with the most significant contribution in terms of intensifying the German-Bulgarian business relations within the past year. The jury consisted of representatives of the German Embassy in Bulgaria, the German Agency for Investment and Trade, the Institute for Market Economics, the Executive Agency for Promotion of Small and Medium Enterprises, GBCIC and Advisory Board “industry “to GBCIC.